2013 A Year for Abundance! David Blume will join celebrated host/reporter George Noory for a special: Coast to Coast AM 10th Anniversary program. David will be on between 10 and 11:00pm talking with George about the E15 smear campaign as well as how the Oil Slick conspiracy continues with Gas Price manipulation, Fracking and a recap of how David’s post-election energy forecast is looking. This program will be available on the Coast to Coast Am archive as well if you happen to miss it. The U.S. Appeals Court ruled on Friday to dismiss a lawsuit against the U.S. Environmental Protection Agency for its approval of E15. Deja Vu or a lesson for 2010 that still rings true today! Daryl Hannah and David Blume will speak about the importance of increased blends of ethanol on Wednesday, March 24, in California. 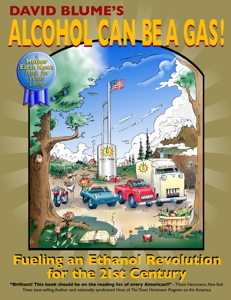 Hannah and Blume, author of "Alcohol Can Be a Gas," will encourage the U.S. EPA to rule in favor of E15 at the International Institute for Ecological Agriculture (IIEA) briefing. The results of an emission test of the Pontiac Trans-Am Hannah drove in "Kill Bill" will be presented at the event. "The car was converted to run on ethanol last fall and refutes the EPA's concerns about higher blends of ethanol not being appropriate for older vehicles," according to a press release for the event. "The testing compares the exhaust emissions of unleaded gas with E10, E15, and E85 fuel blends demonstrating that there is no reason to delay increasing the use of alcohol as a blended additive to reduce toxic emissions currently generated by burning gasoline." Dave Stoltz of Pacific Flyer Engineering will be on hand to answer questions. He was the mechanic for the Trans Am car conversion project. 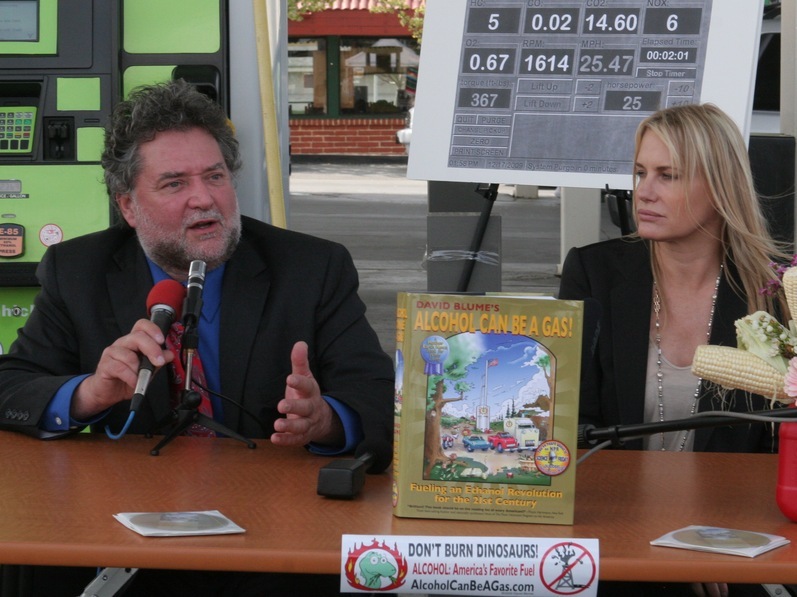 The event was held 3/24/10 at Flyers, an E85 fueling station located in North Highlands, Calif.
Actress Daryl Hannah has put her name and image behind the move to boost the allowable blend of ethanol with unleaded gasoline from the current 10 percent to 15 percent. 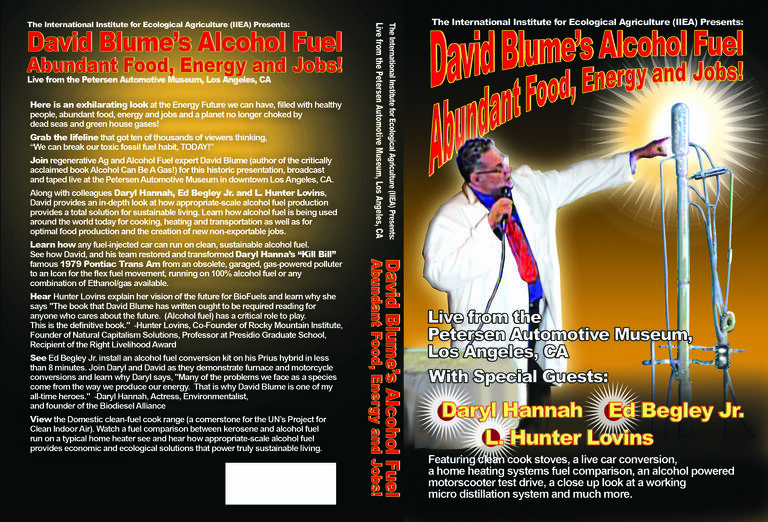 Hannah and author David Blume (“Alcohol Can Be A Gas”) will speak at an E85 refueling station in North Highlands, Calif., on Wednesday. The event will be shown at 4:30 p.m. on live video feed. The U.S.Environmental Protection Agency is readying a decision on E15, which it delayed last December into the middle of this year. One issue has been a complaint from car manufacturers that older model vehicles won’t run well on the ethanol blend, potentially jeopardizing extended warranties. Farmer, Permaculture pioneer and small-scale biofuels expert David Blume discusses the importance of proper winter garden prep for ensuring year round productivity. Focusing on permaculture methods Blume details solutions for rainwater management, soil preparation ideal crops and presents a small farm land design ideal for providing sefl-sufficiency and commercial output. 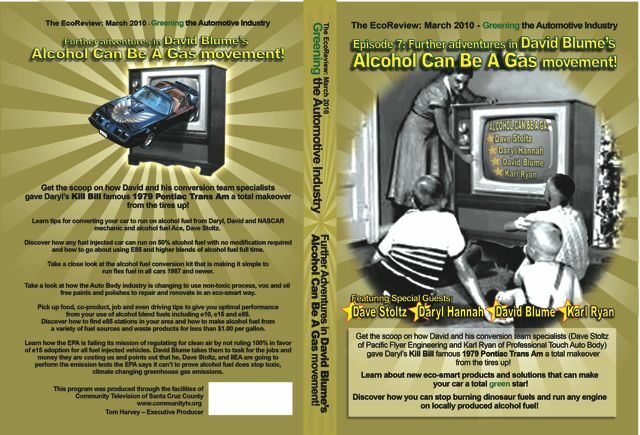 Blume (author of the critically acclaimed and an Amazon.com best-selling book ) "Alcohol Can Be A Gas!" alcoholcanbeagas.com, provides insight based on his years of experience in founding and running one of the country's top small-scale Community Supported Agriculture (CSA) operations and how to make the most of the land we have available for organic, sustainable and independent living. 4) Help Support IIEA’s work! Good News: You are not alone and you can be a key part of the energy independence revolution! All the best in 2013 and on to Abundance!